The Places for People Neighbourhood Survey was the third instalment of a Jan Gehl inspired longitudinal study for the City of Melbourne. Taking place every 10 years, 2015 was the first time the community directly participated in the study. Harvest designed and developed a custom application to help the City better understand where people go to access a range of services within the City. 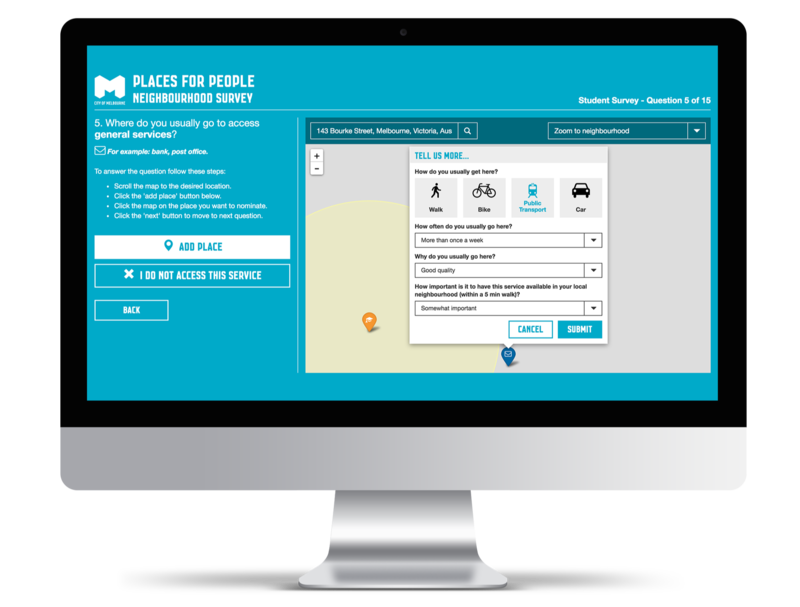 The survey asked users to provide map-based feedback indicating where they go to access individual goods / services in relation to their home or place of work. The data collected through the survey enabled planners to better understand people’s behaviour and to identify service gaps in the future planning of the City’s neighbourhoods.